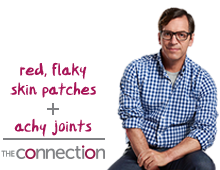 Get more info about psoriatic arthritis + HUMIRA. Sign up for The Connection to receive useful facts and patient tips online and in your mailbox. See how two symptoms can point to one condition. Plus, find out why a rheumatologist can help and more. *Symphony Health Solutions, PatientSource™ patients transactional dataset. January 2012–September 2015.